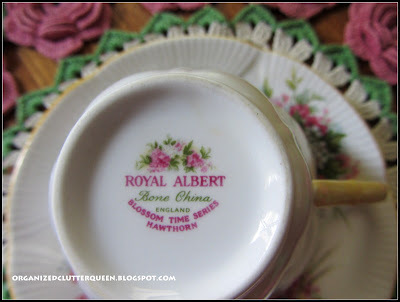 I guess of all the English bone china tea cup manufacturers, I am most familiar with Royal Albert. My most collected flower, the rose. But today I am sharing a beautiful cup and saucer by Royal Albert called Hawthorn in the Blossom Time Series. 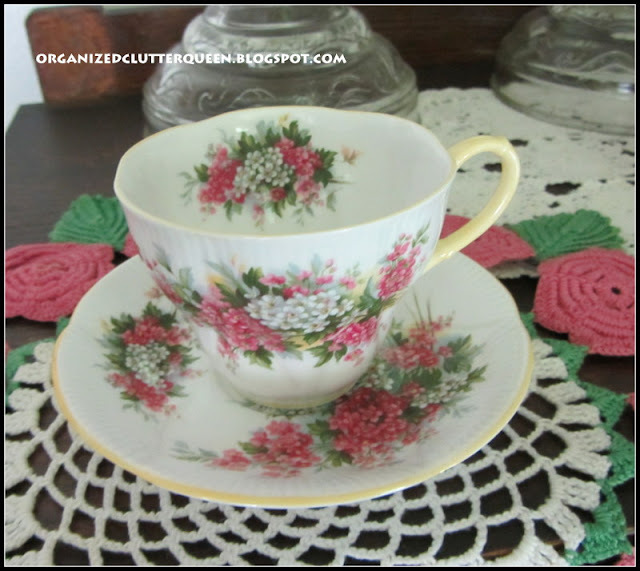 Dainty fluting on the cup and saucer, small pink and white blossoms and yellow edging. A small area of the pattern inside the cup. A very special tea cup in my collection! It is quite pretty. I also like that copper colander from the previous post. I have a thing for cool colander's. i enjoyed your blog. How interesing -- my Grandmother made the same doilie for my mom. Channeling the Queen and all the Olympic pomp and circumstance with your fabulous china finds! Oh Carlene, that teacup is a beauty! I love the flowers & the yellow trim. 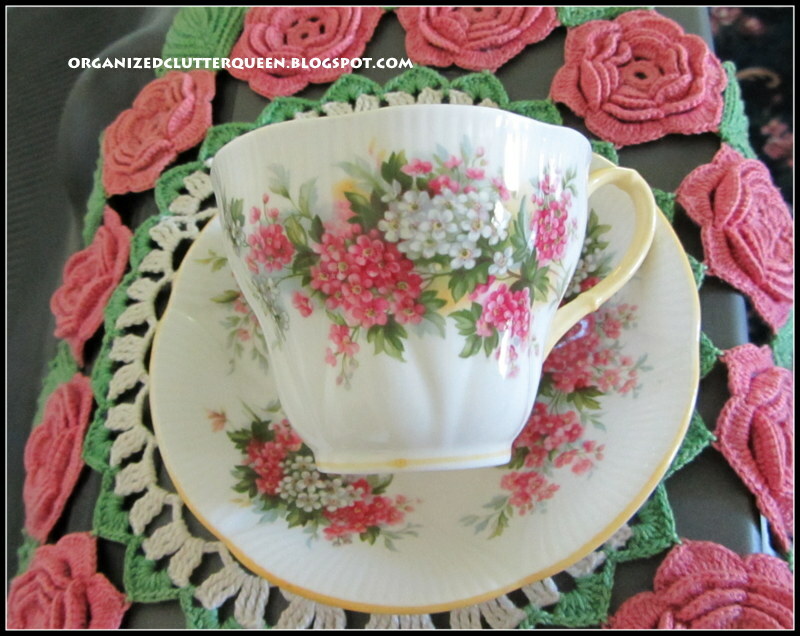 Carlene, the teacup and saucer is beautiful. It is absolutely gorgous on that doily! Such a beautiful teacup! 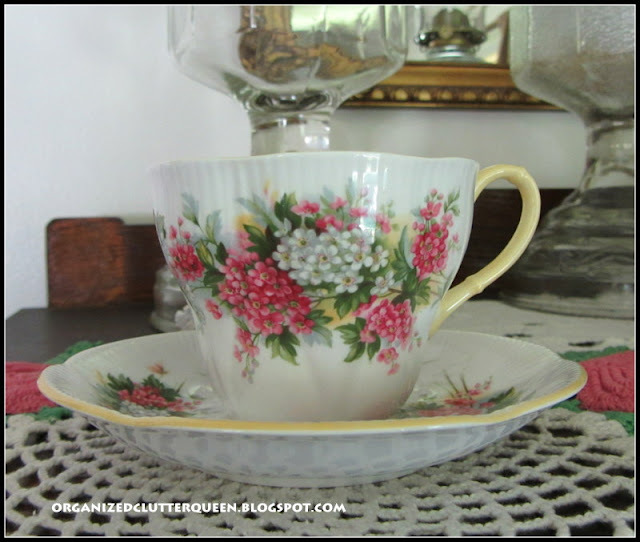 I have seen lots of Royal Albert teacups posted and love them, I don't own one but will keep an eye open for one to join my collection. My favorite, like you, is the love of anything "roses". But I just love, love, love the pattern on this tea cup! How dainty and how beautiful! Can I have? Smile! Seriously, where does one obtain such a beauty? I just found your site and I love it! I don't know how else to contact you ~ hope you don't mind me going through the "comments" to do so. I tell you the truth that my mouth was watering looking at all the beautiful photos of your home. BUT when I was looking at the dining room [?] there is a floor fan that my jaw dropped at the site of!!! Is that original or did you make the base and stand? I would love this! I showed my husband and he showed tremendous interest. Could you share with us? It's a Deco-breeze fan. I bought it at the furniture store I work at but they are online also. What a gorgeous teacup! Love the pattern! Very similar to Shelley Blossoms. 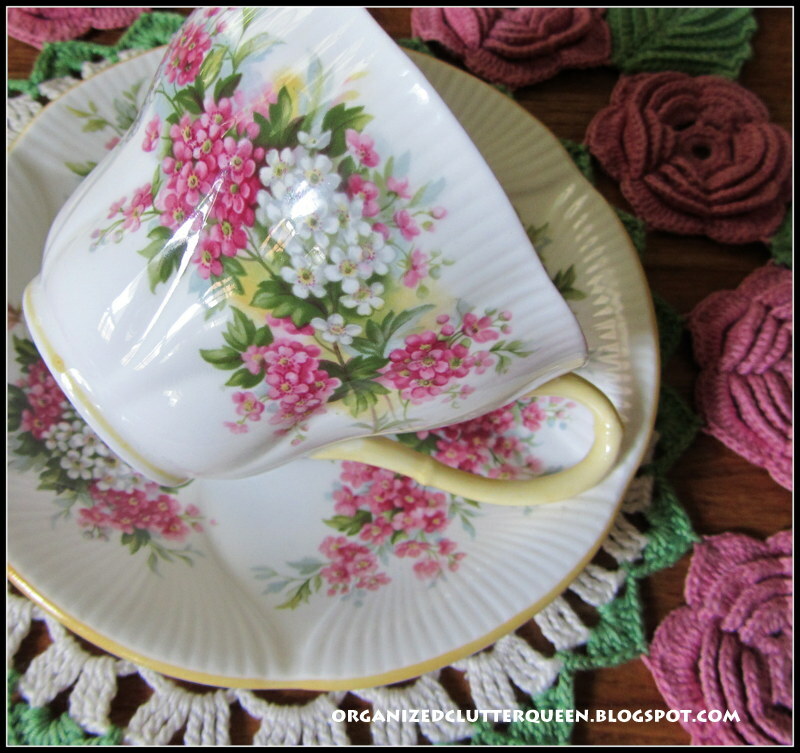 Thanks for sharing your treasure and linking to Tuesday Cuppa Tea! So pretty!! I love the floral design on it and the yellow handle!! I think the pattern of your cup is very pretty! Royal Albert is a favourite of mine also and I like your featured pattern today. So beautiful and so dainty. 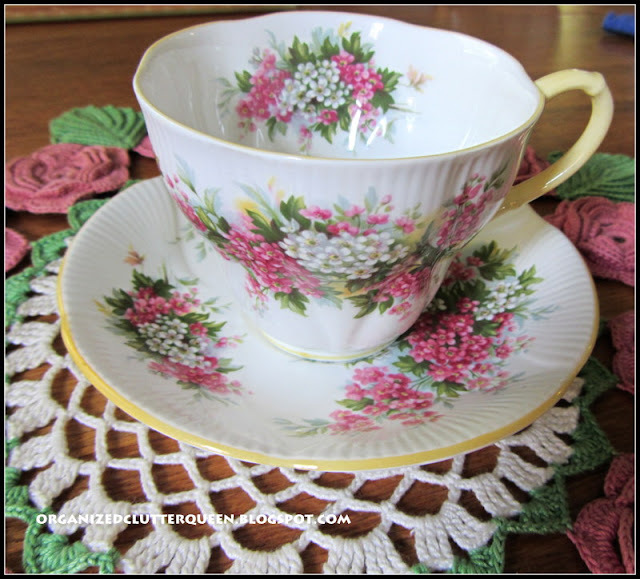 Your Hawthorn teacup is very pretty! I love the shape of it as well as the blossoms and yellow edging. Thank you for sharing it with us and joining me for tea today. Have a wonderful week.